When searching for eye creams, many men can feel out of their element. 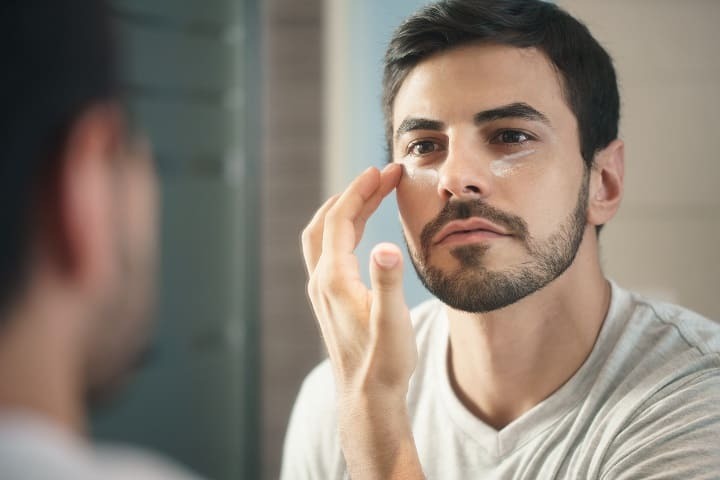 Choosing the best eye cream for men can be confusing – especially when there are thousands of brands on the market filled with lengthy, complicated ingredients. Luckily, we are here to help. Our experts have scoured the enormous world of anti-aging eye lotions to discover its innermost secrets. We’ve taken all the knowledge gleaned and used it to create this comprehensive buyer’s guide. The following will explore the different facets of eye creams, offer a guide to navigating this growing market, and divulge the best way to search for the perfect eye cream for yourself. What Is an Eye Cream for Men and the Benefits of Using It? An eye cream is a specialized lotion, or serum, intended for the fragile skin located near the orbital bone. When applied, it seeps into the affected area and begins corrective treatment. With anti-inflammatory ingredients, eye creams can help reduce redness and swelling around the eyes. Antioxidants in these creams can also help reverse the damage done by years of harmful sun damage. Most importantly, the ingredients can address the fine lines and wrinkles that begin to show as you grow older. This is what makes eye cream so special; if you use it properly, you can actively fight the process of aging. Who doesn’t want that? 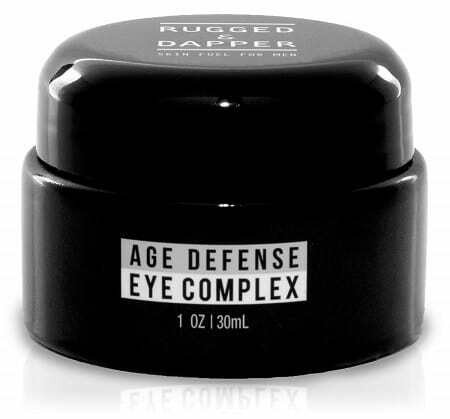 There are two main forms of anti-aging eye products. First, there is the eye cream, which is sometimes adopted as an all-encompassing term for the product. Second, there is an eye serum. The following will explain some of the differences between the two so that you can decide which is right for you. An eye cream is a much more viscous material than serum. It tends to be in the lotion form, and it requires manual distribution to be applied. There are many who prefer this option because they like their control over the distribution: namely, you can actively monitor your dosage through how much you apply. Others prefer creams because of their milder ingredients, which are less aggressive on sensitive skin. Unlike a thick cream, serums are thin liquids. Serums differentiate themselves from creams because their composition is much more potent. With ingredients like hyaluronic acid and neuropeptides, serums can deeply penetrate the affected area with minimal application. Customers who prefer serums love the raw power contained in the product. This liquid can undo the deepest forms of damage without requiring an excessive application. All the user needs to do is apply minimally with an eyedropper and let the serum get to work. It’s important to note that there is no right or wrong answer on the cream vs. serum debate. Both have benefits and detriments that vary from person to person. So the decision truly lies within your own tastes and needs. As in all products, make sure to search for the item that best suits you and your lifestyle. Whether you’re looking for eye products or the best beard grooming kits, look for what will make you happy! What Ingredients Should the Best Eye Cream for Men Have? When you look at the ingredients in an eye cream, it is easy to get lost in the complicated jargon. The ingredient list can be stuffed with lengthy scientific terms, obscure anti-inflammatories, and non-descript antioxidants. Yet, once you know what to look for, you will find that your search will become much easier. This is why we’ve compiled a guide of the best ingredients to look for when purchasing men’s eye cream. 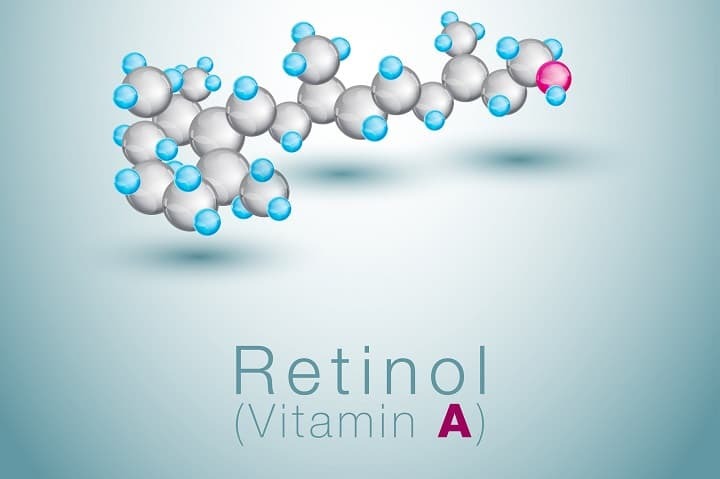 Mostly seen in serums, retinol is a vitamin A derivative that can stimulate your skin’s cellular reproduction. Its connection to vitamin A allows it to protect against sun damage and ensure that your skin will remain young and springy for years to come. When it comes to hydration, ceramides are the perfect conduit. These lipids help form your skin’s barrier and retain necessary moisture. This will keep your orbital area refreshed and ready for whatever the day brings. Contrary to popular belief, caffeine isn’t just for early morning consumption. In fact, this chemical is great at reducing swelling and increasing blood circulation. So, regardless of application, caffeine can give your skin that extra pep in your step! Many think of chamomile as a tea reserved for bedtime while clothed in the top pajamas for men. Yet, chamomile and its extracts house amazing healing balms, which can supersede its use as just a great tea. Armed with antiseptic and anti-inflammatory benefits, this extract is perfect for protecting the skin near your orbital bone. This soothing extract will use its protective capabilities to treat the sensitive area around your eyes. Your parents were right when they told you to take your vitamins. Vitamin C and E are notable because they are both powerful antioxidants. The former stimulates collagen production, whereas the latter soothes and hydrates the skin. Together, these acids use their anti-inflammatory powers to fend off the radicals caused by sun damage. As with most things in life, the best results take time. Remember, your skin is the largest organ that you have: change will not happen overnight. Many avid eye cream users state that it should take four weeks for results to begin to show. This is not simply a marketing ploy, it is actually science. This is due to the fact that your skin is on a constant cycle of regeneration. The term for this is desquamation, and it’s the process by which old skin cells are shed and replaced with spry new ones. Desquamation occurs every twenty-eight days or four weeks. This means, that if you really want to see if your new skincare regimen is effective, you will need to be patient and wait. Remember, you can’t test the longevity of eye cream after one use; that would be like seeing how durable straight razors are, after using them for only a few shaves! As stated previously, there is no universal best eye cream for men. 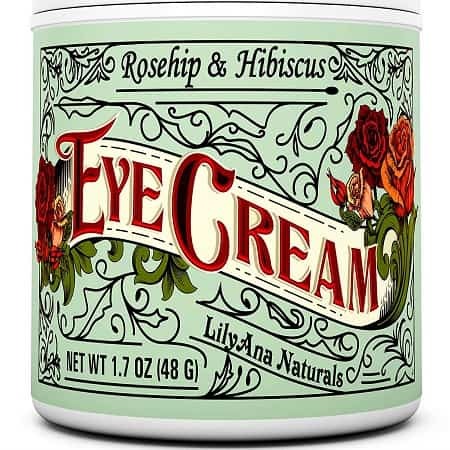 There is, however, an eye cream that is perfectly suited to you and your needs: all you need to do is find it. You can use the following tips and tricks for sorting through the market, and find what is best for you. There are many different skin types. Before you buy, make certain you know exactly where you fall. If you already have oily skin, you will want to avoid a product that contains excess oil. If your skin is on the drier side, look for a cream that advertises moisturizing properties. Or, if your skin type is a combination of the two aforementioned features, look for something that will accommodate both. If you find yourself staring at the small lines that accompany your ocular area, then you will want to look for a cream that uses retinol. This ingredient’s regenerative properties can restore elasticity and improve collagen production. Collagen is a protein that provides skin structure and strong bones. By boosting collagen production, retinol smooths out fine lines and replaces them with a youthful glow. If people are constantly telling you that you look tired, then you probably suffer from dark circles. This sunken appearance can be hereditary, or the result of a bad night’s sleep. To fight dark circles, look for a cream that contains the vitamins C and K. These antioxidants will work together to reduce the appearance of sunken eyes. Regardless of your needs, you are definitely going to want a product that incorporates sunblock. This is because excessive solar UV rays are the main cause of aging in humans. The sun causes wrinkles, sun spots, a compromised skin elasticity, and countless other signs of aging. If you are prone to sporting baggage in your eye sockets, then you will want to look for a product that fights puffy eyes. Make certain your cream features soothing ingredients. These can come in the form of coconut oil, aloe vera, caffeine, green tea, or cucumber. The ingredients will use their anti-swelling properties to reduce puffiness and remove excessive eye bags. When it comes to eye product, a little goes a long way. Much of the cream or serum will be absorbed into your skin, so make certain not to oversaturate your eyes. You should use your ring finger because it is your weakest digit. As stated previously, the skin around your peepers is especially delicate. You’re going to want to approach this process with a nimble touch; thus, you should always use your ring finger. This step isn’t mandatory, it just helps if you plan on applying the cream to both eyes concurrently. If you would rather apply to one eye at a time, that’s okay too! This will help equally distribute the cream. Make certain that you are dabbing, and not rubbing: any aggressive motion could bring further harm to the sensitive skin. Once more, use a patting motion to encourage the cream to absorb. You’re going to want to start from the inner orbital area and work your way out. This will evenly distribute the cream, and this motion helps fight the onset of wrinkly skin. Continue your morning routine, such as using a hair pomade for men, and let the eye cream do its work! One of eye cream’s main purpose is to fight the appearance of ‘eye bags’. These puffy circles are usually blamed on how stressed, sleepy, or emotionally conflicted we are. Yet where do these circles come from? The true culprit behind bags may not be lack of sleep. Instead, it could be something much simpler: gravity. Gravity is always and forever pulling us down. 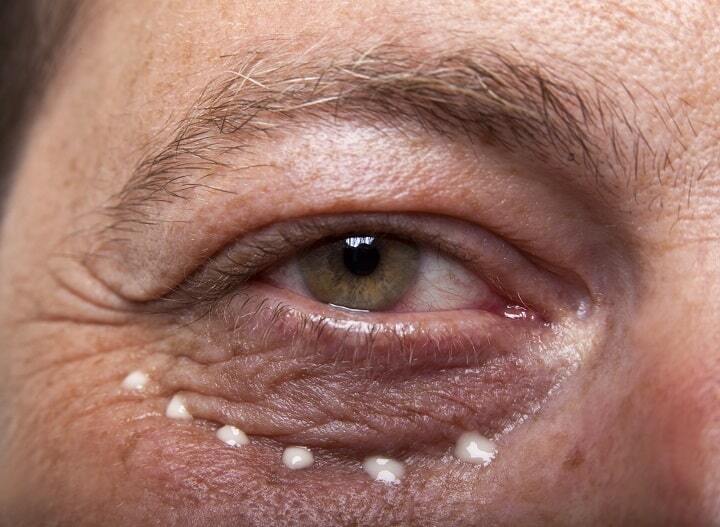 It’s what causes sagging skin, shifting bones, and, apparently, puffy eye bags. As you age, gravity pulls down on your lower orbital skin and creates those accentuated half-moons. It also pulls down on fat deposits, which further droop with age. Normally, your muscles and skin stop the process of gravity. Yet, lower collagen in the skin creates less elasticity. This means your skin is less likely to spring back. Your muscles also lose their tissue strength, which allows gravity to overcome them and bring your bags down. Although there is no direct link between sleep deprivation and eye bags, it’s clear that a bad night’s sleep can only accentuate the problem. So, although you cannot fight gravity, you can stall its effects. Use an eye cream with natural ingredients like green tea or chamomile extract to fight bags. If you truly want to fight puffiness: get in bed, put on your best silk boxers, and make certain that you get a decent amount of shut-eye tonight! 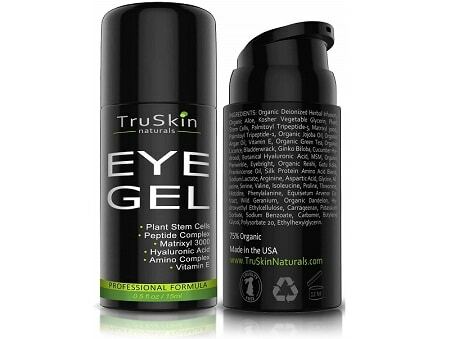 The lightweight and powerful formula of TruSkin Naturals Eye Gel is designed to help you effectively deal with all possible problems you might have around the eyes area. If you’re struggling with tired and puffy eyes, this product will address the problem and get rid of it at the core. Some of the issues you’re no longer have to endure are dark circles, eye bags, under eye sagging, loss of tone and resilience just to mention a few. Basically, this item takes care of any struggle eye area concerned. In touch with the skin, it creates a mildly cooling effect and hydrates it. This is made possible with a concentrated blend of powerful, botanically derived amino acids, advanced peptides and steam-distilled cucumber hydrosol. That being said, it’s necessary that you first patch test the gel at least 24 hours before you apply it. In case you’re allergic to any of the ingredients, it can cause you irritation and breakouts. 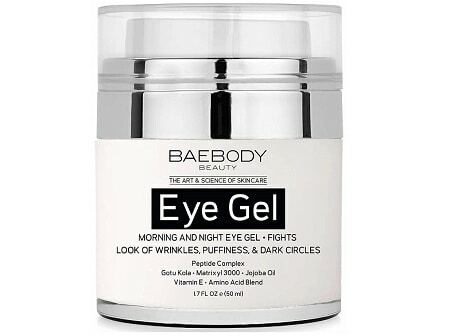 Meant to be used in the morning and again at night, BaeBody Eye Gel has proven that it’s an excellent solution for fighting dark circles, puffiness, eye bags, fine lines and sags around the eyes. Also, it doesn’t dry out the skin in this area, which is very important for your skin’s health. The size of the tin is pretty generous for this type of product. The gel comes with a nice pump that distributes just the right amount of product you need per one use. When using it for the first time, make sure to pump slowly 5 to 10 times. This process will activate the vacuum pump system making it all functional. In case you have skin sensitivity or some kind of allergy, this gel isn’t for you. The list of ingredients includes aloe vera, hyaluronic acid, a peptide complex, amino acid blend and more. Although the potential side effects may vary, it’s possible that you can feel a slight burning sensation, irritation or stinging. If this happens, immediately stop using the product. 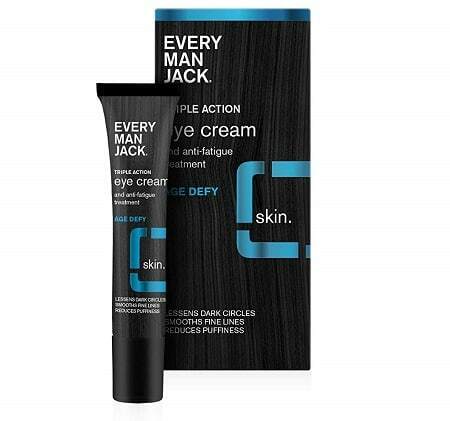 Light and non-greasy innovative formula of Every Man Jack Eye Cream is enriched with vitamins and anti-oxidants that work wonders in reducing dark circles around your eyes. 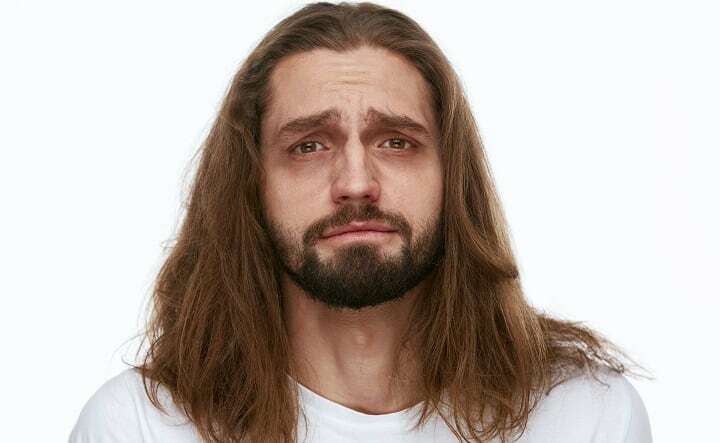 The reason why this product is so miraculous lays in the fact that it starts working pretty quickly and you notice a difference in just a few hours after the application. If you’re struggling with premature signs of aging, after this product, they’ll become a matter of the past. Also, the formula is really good at reducing wrinkles and dark circles under your eyes. All the benefits come from the organic ingredients included in the mix, such as Myrtus leaf, green tea, aloe vera and cocoa butter. The first one adds elasticity to your skin and reduces fine lines, while green tea, aloe and cocoa butter soothe and hydrate it. 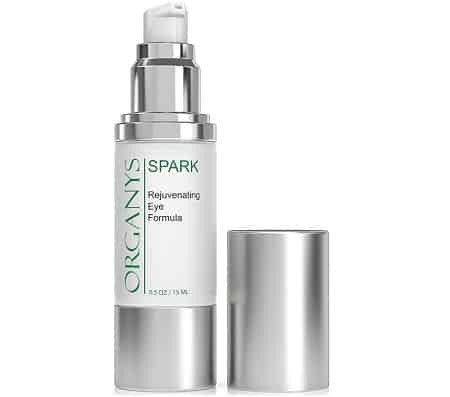 A combination of vitamin C, hyaluronic acid, caffeine and anti-wrinkle peptides makes a powerful formula of Organys Spark Eye Cream that rejuvenates the skin around the eyes. Generally, it doesn’t contain fragrances, parabens, sulfates and other harmful ingredients. However, if you’re allergic to its ingredients, it’ll lead to irritation causing burning and stinging sensations. If you’re not allergic, then you’ve got yourself an effective eye cream that’ll help you get rid of those stubborn dark circles and eye bags. Besides that, this item significantly reduces the appearance of puffiness and crow’s feet and improves the wrinkles and fine lines under your eyes. The bottle it comes in is pretty small, but for the low price it’s sold, you can always purchase a new one and never regret it. 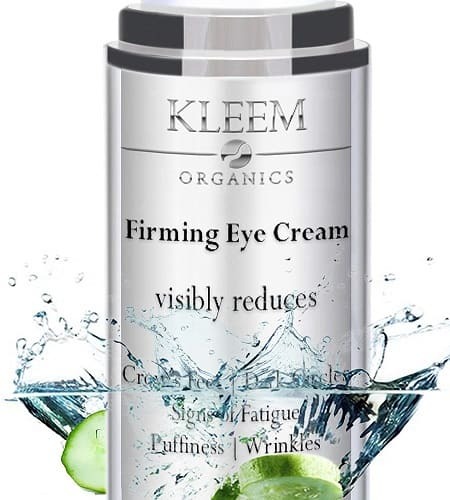 Numerous carefully selected organic ingredients of Kleem Organics make the powerful blend that is proven to deliver exceptional results in eliminating dark circles and wrinkles. Besides that, it also fights all signs of puffiness, bagginess, sagginess and tiredness, making your skin around the eyes looking tighter and healthier. The cream penetrates the skin within a few seconds and doesn’t leave sticky, greasy or shiny traces along the way. This is due to the smooth consistency that allows it to absorb quickly into the skin. Because there aren’t any chemicals and dyes, you won’t experience any irritation. Bonus that you’ll receive when you purchase this item is a free ebook on natural home remedies that can help you treat the skin around the eyes. Most customers’ only complaint is about the price and the pump. The price is really a bit higher, while the pump doesn’t work well, even after you press it multiple times. Made to relieve dark circles, under eye bags and puffiness, Rugged & Dapper Eye Cream is appropriate for all skin types and men of all ages. 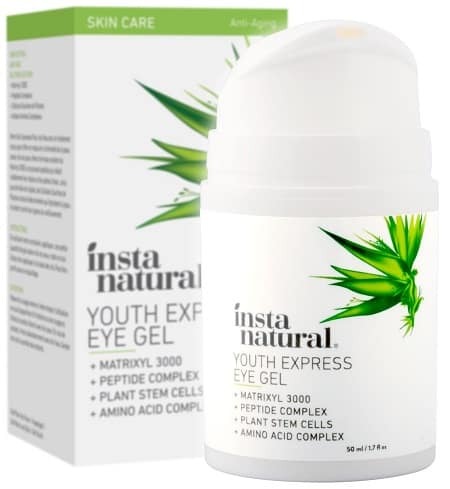 Ingredients such as aloe vera, jojoba oil, green tea, botanical hyaluronic acid and ginkgo biloba make a multi-action formula that soothes and hydrates the skin area under the eyes. The product soaks into the skin fairly quickly and you can notice some of the results since the first use. You can expect that any visible signs of fatigue around your eyes will diminish. Also, your skin will look rejuvenated, without dark circles, fine lines, wrinkles and puffiness. The cream feels a bit sticky, but for the benefits you experience, this isn’t a big deal. Nevertheless, the product is only 1 oz, so you might find it to be overpriced. No matter if your skin is oily, normal, greasy or sensitive, you can use LilyAna Naturals Eye Cream because it’s safe for all skin types. It doesn’t contain any parabens or artificial colors and fragrances that can damage the skin area around your eyes. Instead, it’s made of powerful, organic ingredients like vitamin C, hibiscus flower extract, vitamin E and rosehip seed oil that have multiple benefits. It works best if used in the morning and at night. With regular application, it eliminates wrinkles, sagging and fine lines, while increasing skin’s elasticity at the same time. Additionally, it improves skin tone, texture and removes small scars if you have them. You’ll notice that your skin is hydrated, softer and smoother, with no signs of premature aging. Something that might worry you is the claim of many customers who’ve noticed that the cream gets moldy after some time, but the reason behind this remains unknown. 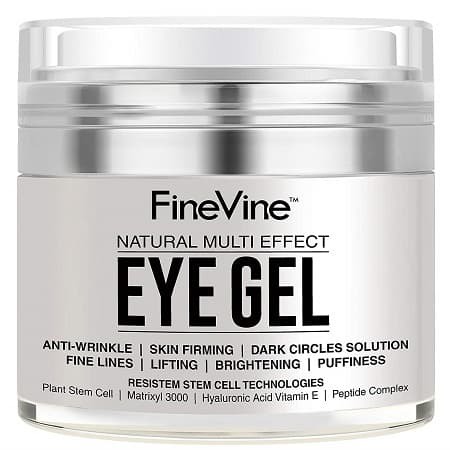 Regenerated skin with fewer problems around the eyes area is what you get with FineVine Multi Effect Eye Gel. Being quick absorbent and without causing stinging or burning, this gel doesn’t feel too heavy or oily. Nevertheless, it’s possible that you spot a little sticky residue. Because there are no parabens, dyes or fragrances, this product doesn’t cause negative consequences, burning and stinging sensations. The formula is great in masking the premature signs of aging, dark circles, bags, wrinkles, crow’s feet and puffiness around your eyes. Furthermore, it works like a charm in moisturizing and hydrating your skin. Don’t forget to test it on a small area first, to ensure that you’re not allergic to some of the ingredients. 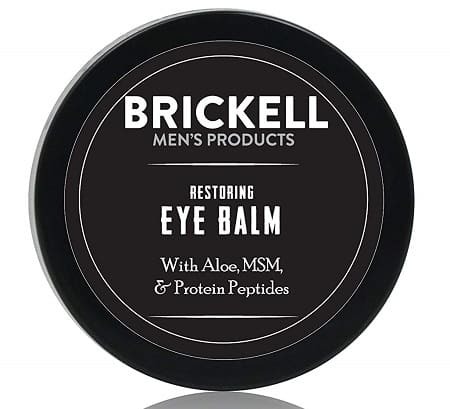 No matter your age or type of the skin, Brickell Eye Balm will successfully reduce the appearance of dark circles, bags, wrinkles and puffiness under your eyes. Immediately after you apply it, it’ll soak into the skin, leaving no greasy residue and shine. Over 97% of the ingredients are completely natural and 70% organic. Some of them include aloe vera, vitamin C, green tea, protein peptides and hyaluronic acid. The tin this balm is packed in is, however, very small. This is important to mention because the product is way overpriced for such a small amount you get. It is very effective though and lasts for long providing that the small amount goes a long way. Taking into account that some other less expensive options are equally good at dealing with eye area skin problems, you might want to check them out before making a final choice. 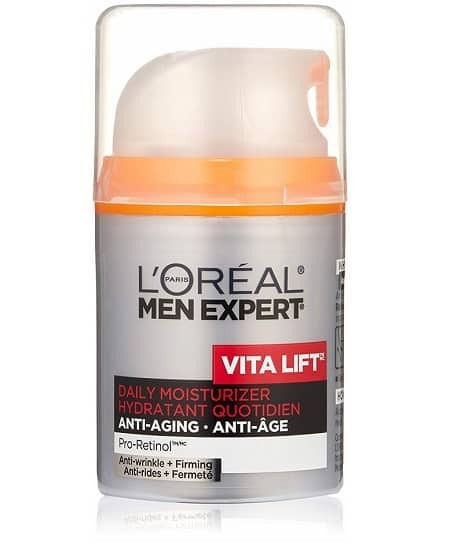 Formulated with pro-retinol A and par-elastyl, L’Oréal Paris Men Expert VitaLift reduces signs of aging such as wrinkles and sagging, while simultaneously tightening the skin on your face and neck. For the maximum results, it’s recommended that you use it two times a day for 4 weeks when you’ll start noticing that your skin is smoother, healthier and younger looking. The product also contains SPF 15 sunscreen to protect your skin against damaging UVA and UVB sun rays. Benefits of this product don’t stop there as it also protects your skin from irritation, burning and redness. Its texture is thick and cream-like and it feels light when applied on the face. Your skin type isn’t a problem because this cream is suitable for all types. Distinctive and strong masculine scent is something that you rather love or hate. However, most buyers claim that they like it even though it’s overwhelming in the beginning because it eventually fades away. 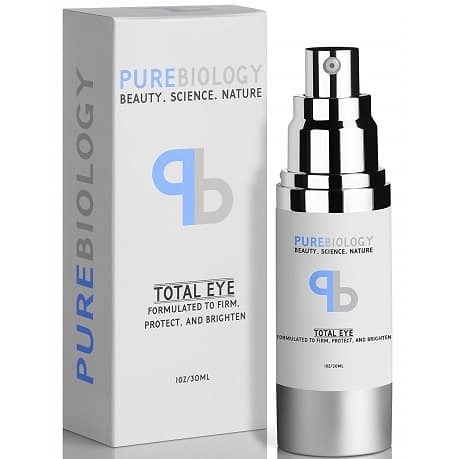 A unique formula of Pure Biology Total Eye Cream that includes baobab tien – blend of amino acids and antioxidants is very potent in hydrating your skin and making it look younger. As soon as you put the cream on your face, you’ll notice that it has started working. The appearance of fine lines, bags, dark circles and puffiness will be significantly reduced since the day one. The product absorbs ultra fast and doesn’t leave a sticky or greasy residue. Utilizing more than 90% of natural ingredients, it’s bound to tighten up your skin and erase the unsightly bags under the eyes. This also means that you won’t experience any redness or irritation that usually follow when using some similar products. The scent is not strong at all and it’s rather pleasant. To ensure that you don’t overapply the cream, the pump distributes just the right amount of product you need for both eyes. A potent peptide called Matrixyl 3000 is the part of the mix of InstaNatural Eye Gel that noticeably smooths crow’s feet and fine lines. Other ingredients include plant stem cells, amino acids and hyaluronic acid, known for strengthening the skin and preventing visibly, early signs of aging. It’ll help you get rid of dark circles, puffy eyes and undereye bags once and for all. Many satisfied customers can confirm this. Whether your skin is normal, oily, dry or sensitive, you can use it without fear that it’ll have any side effects. Worst case scenario, it’ll dry your skin a bit, in which case you can stop using it. Another thing you might experience is the sticky feeling in the area around your eyes. All in all, the gel comes in a reasonably big tin and it’ll last you for a long time because just a little is enough per application. Working while you’re asleep, Bee Friendly is primarily a night time moisturizer that effectively deals with signs of aging like wrinkles, fine lines and others. It doesn’t contain any harsh ingredients and fragrances that can irritate or damage your skin. 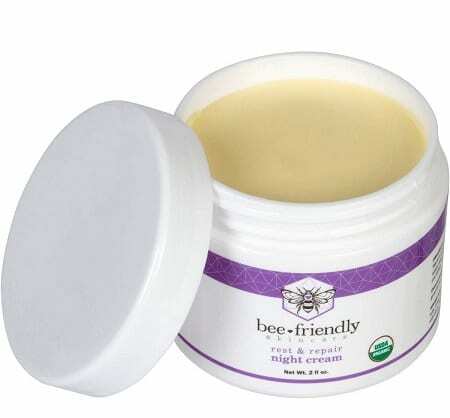 The formula is crafted of beeswax, raw honey, propolis, olive oil and more. All of these ingredients are good for your skin, regardless of its type. Being almost entirely organic and natural, this product won’t irritate your skin nor close your pores. Besides, it’ll improve its elasticity, tone and make it smoother and softer. This item might be more on the expensive side, but it’s 2 oz, so it will last you for very long. Slightly oily skin is the most common side effect that the already existing customers have spotted. The world of eye creams can be oversaturated and confusing. Yet, with enough preparation, you can unlock the secrets to a healthier and younger looking you. If this article piqued your interest, feel free to check out the rest of our website. We have awesome detailed guides that cover all things manly. From the best big and tall gaming chairs to the most effective toothpaste to get rid of bad breath, we’ve got you covered! Photos from: puhhha / depositphotos.com, tonodiaz / depositphotos.com, diego_cervo / depositphotos.com, NikiLitov / depositphotos.com.